The MS2717A is the new Anritsu Economy Spectrum Analyzer with superior performance and advanced capabilities at a surprisingly affordable price. Designed for engineers and technicians needing advanced yet economical spectrum analysis tools, the MS2717A redefines the economy class by delivering impressive value that lowers overall cost-of-test on wireless components. Several smart measurements are built into the MS2717A, including channel power, adjacent channel power ratio, Carrier to Interference ratio (C/I), and field strength. In addition, an AM/FM/SSB demodulator is included. Demodulated signals can be monitored using the internal speaker or by using a universal 2.5 mm 3-wire headset, such as used with many cellular telephones. The WCDMA/HSDPA RF measurements (option 44) and WCDMA demodulator (option 45) are a first for the economy class of spectrum analyzers. 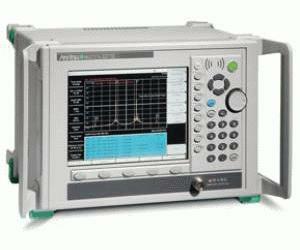 The signal analyzer mode frequency ranges are 824-894 MHz, 1710-2170 MHz and 2300-2700 MHz. For basic RF measurements, option 44 offers smart measurements of ACLR, multi-channel ACLR, spectral emission mask, and RF summary tables for quick Node-B analysis. For detailed demodulation analysis, option 45 provides Code Domain Power, Codogram, EVM, and modulation summary for detailed Node-B analysis. Pass/Fail mode is also available using the five 3GPP test models (reference TS125.141 specifications) to further simplify testing. The MS2717A spectrum analyzer best in its class typical DANL of -153 dBm (10 Hz) at 1 GHz, resolution bandwidth (RBW) range of 10 Hz to 3 MHz and video bandwidth (VBW) range of 1 Hz to 3 MHz. It also has the fastest sweep speeds of any spectrum analyzer in its class. The use of external Compact Flash memory modules allows an unlimited number of traces and setups to be stored. Remote programming using the Ethernet 10/100 Base-T connection is provided using SCPI programming. The Ethernet connection and the USB 2.0 connection give the user flexibility in remotely operating the instrument using remote access software from Anritsu, shipped with the product. Measurements and setups may be uploaded and downloaded using either the Ethernet or the USB connection. The MS2717A is shipped with a User Guide, a CD ROM containing Master Software Tools and USB driver, a USB A-mini B cable, an Ethernet Cable, a 64 MB Compact Flash module. Every MS2717A has a one year warranty for parts and labor and is shipped with a certificate of calibration & conformance.